Happy Tuesday! Are you all back in the swing of things?? This is the first day in 3 weeks where I have had NO KIDS at home... It is so quiet! I plan on being productive today. After a phone call yesterday I learned I had a short amount of time to whip up a card for the Stamp Ink Paper challenge! 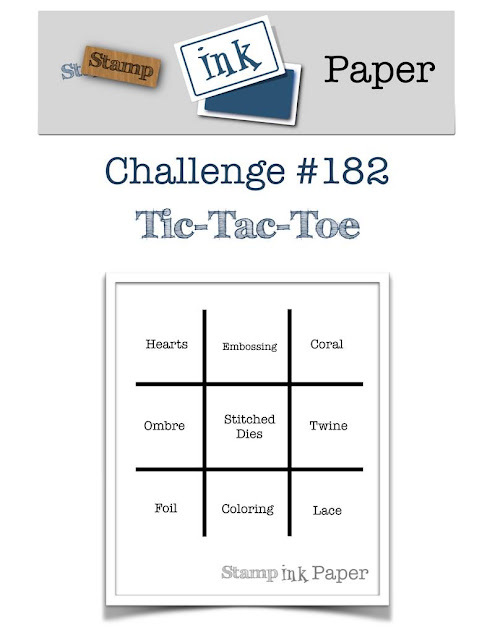 This weeks challenge is a fun Tic Tac Toe Challenge! My card actually came together in a matter of 30 minutes, we all know that is record in my studio!! I have combined the Well Said Bundle with the Happiness Blooms DSP! My three in a row starts on the bottom left with Foil-Stitched Dies-Coral! Let me show you what I have created! This fabulous card starts with a base of Night of Navy Cardstock, with a nice mat of Pool Party Cardstock. I have made a fun stitched frame with the Rectangle Stitched Dies in Calypso Coral Cardstock. I had really been on the fence with the Happiness Blooms DSP, but after seeing a few creations with it I was sold. This too is cut with the Rectangles Stitched Framelits and layered a bit cockeyed. I wrapped the Whisper White Baker's Twine around the card front and tied a nice bow before adhereing it to my card base. A nice stitched circle was perfect for incorporating the Well Said Bundle! I have stamped the "For Everything" in Night of Navy and added a few Pool Party freckles from the Bloom By Bloom stamp set. A nice Gold Foil "Thanks" die cut was perfect for this and completed my three in a row! The stitched circle from the Stitched Shapes Framelits is accented with a Grapefruit Grove Colored Doily. Thank you so much for stopping by today! I can't wait to see how you make your Three in a row! Want to order everything to make this card? I have provided a full product list for your shopping needs!